The Tolga Scrub is one of the last remaining fragments of the critically endangered type 5b or Mabi rainforest (Complex Notophyll Vine Forest) on the Atherton Tablelands. There is about 2% of original Mabi forest left. 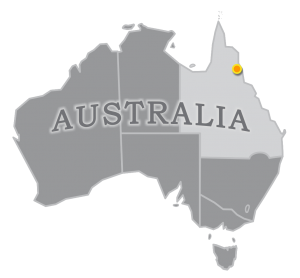 It once covered areas on the fertile basalt soils of the Atherton Tablelands, where the annual rainfall is 1300 – 1600 mm. Tolga Scrub is on the very north-west boundary in the driest part of Mabi distribution. Mabi is characterised by the presence of scattered, mainly deciduous emergent trees up to 45m tall, heavy leaf fall during times of moisture stress and a well-developed shrub layer. It is the most drought resistant type of rainforest in Australia. Widespread clearing of Mabi has resulted in several endemic plant species being listed as ‘critically endangered’. The Scrub was gazetted in 1938 as Subject Reserve #1310 for Flora Preservation Purposes “to indicate and protect what the Tolga area of the Atherton Tablelands was once like”. What does all this mean for Tolga Bat Hospital? We take an interest in the health of the Tolga Scrub, for its own sake as well as its provision of critical habitat for flying foxes. 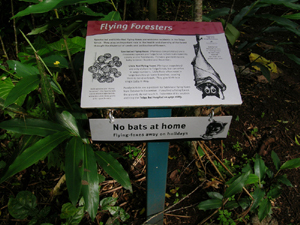 It is the only permanent Spectacled flying-fox camp on the Tablelands, and most years over 500,000 Little Red flying-foxes arrive and stay for a few months when the blossom is plentiful. During tick season the shrub layer makes it very difficult for us to search for fallen bats. Pademelons and rabbits ate all green growth outside the enclosures. Water was hosed into 15 litre containers obtained from the dump. and then returned for recycling. Signage at the beginning of the walking track. Tolga Scrub, only 26 hectares or 65 acres in area, is long and narrow. It is about 2 kms long and 100 metres wide. This high edge to interior ratio results in significant edge effects such as invasion by feral and domestic animals and weeds. The Scrub is bordered on its longer eastern and western boundaries by a railway line / farmland / industrial estate and the Kennedy Highway respectively; the short northern and southern boundaries by a caravan park and high voltage powerlines. Beantree Road separates the northern and southern ends. Some believe this degree of stress will cause the Tolga Scrub to destabilise and deteriorate beyond repair. Our experience has been that the Scrub is changing, for better and worse, but retains an enormous vigour that will ensure its survival. Not only that, it is in the hearts of many Tablelanders, far more so than the more intact fragments of Mabi. It is a landmark through which many drive each day, and it is an island of dense vegetation in the midst of cleared farming land and other development. 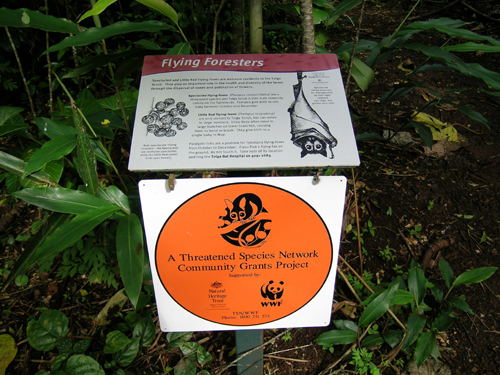 We received a grant from the World Wide Fund for Nature in 2004 for a project “Abating Threats to Spectacled Flying Foxes and their Mabi Habitat”. 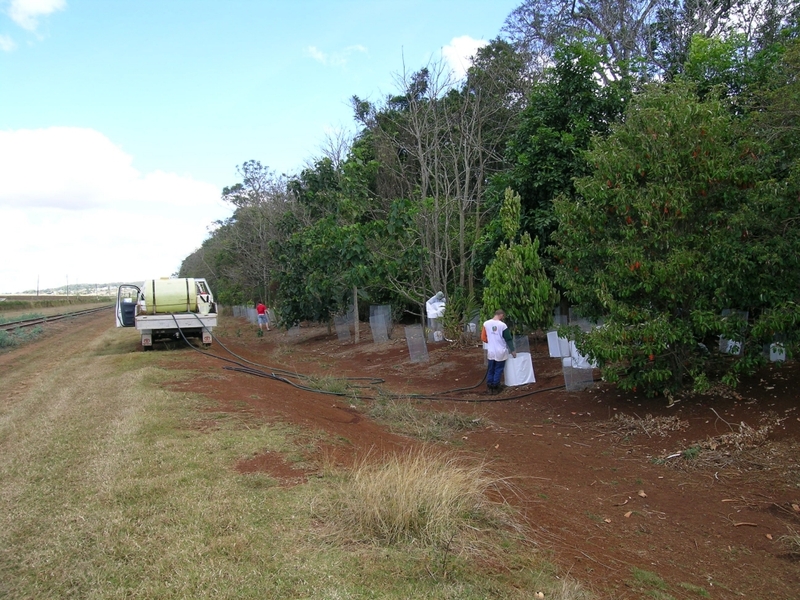 Our partners included the Atherton Shire Council, TREAT, Mareeba Environmental College, Eacham Revegetation Unit, and BRICMA. The aim of the project was to plant 2 areas on the eastern side of the Tolga Scrub to limit edge effects and improve the integrity of this small fragment of forest. Providing a bushy edge to the Scrub and closing the canopy limits the effect of weeds and other invasive elements. Eacham Revegetation Unit dug the holes and students from the Mareeba Environmental College planted the trees. 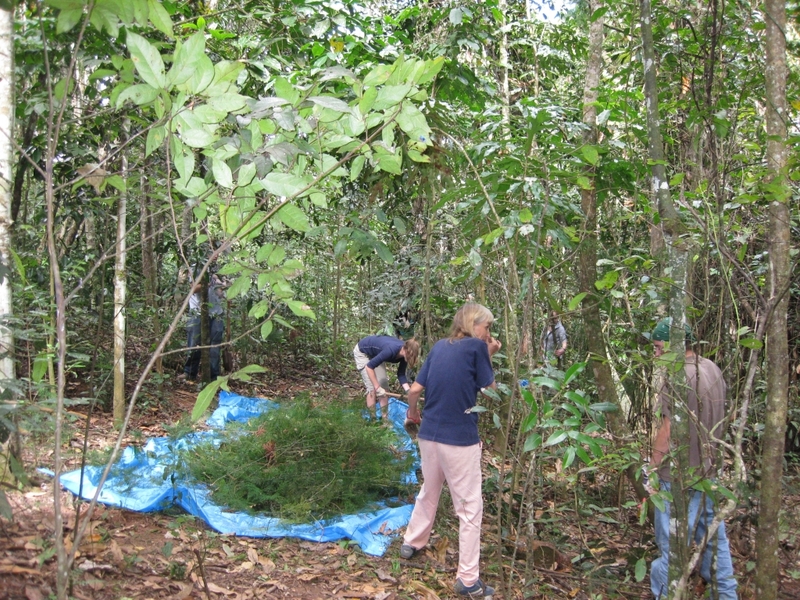 The trees had an initial setback as the treeguards we chose were inadequate for predation by pademelons and rabbits. Stronger treeguards made from wire mesh and fixed to the ground with 3 tent-pegs ensured the safety of the young trees and they have done extremely well. 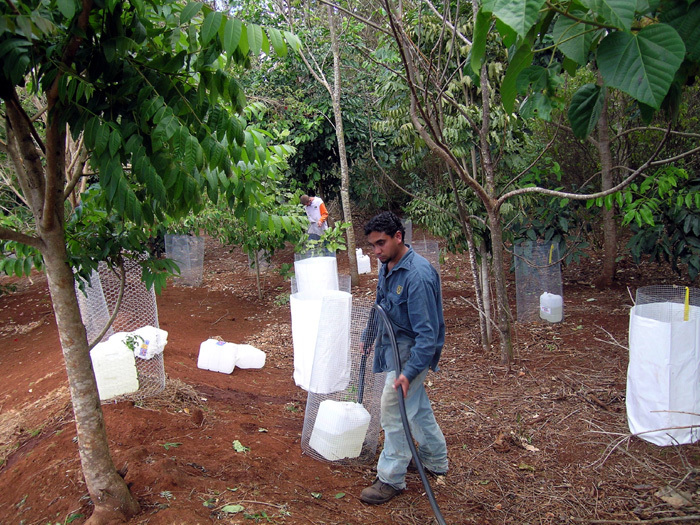 One particularly bare area was fenced before planting, rather than using individual treeguards. 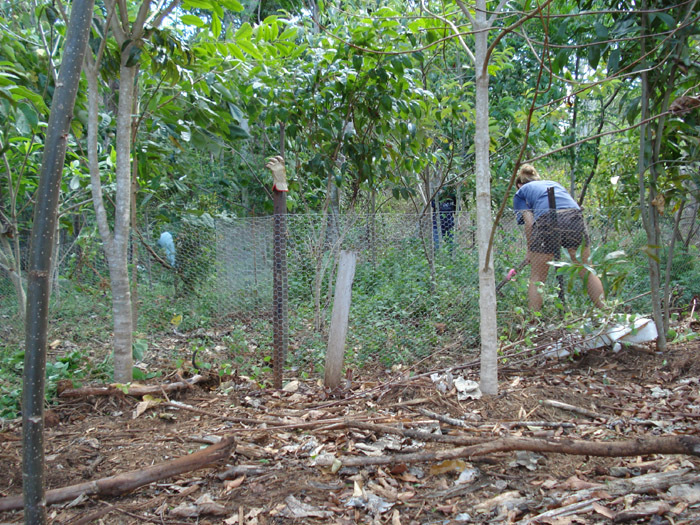 All areas within the fence or within treeguards showed good ground cover even at the height of the dry season, an indication of the level of predation. During the first dry season we started a watering system using old 20 litre water bottles from the recycling area of the local Waste Station. A small hole was drilled in the base to allow slow drip feed watering. The bottles were filled 3 times over a period of 6 weeks by a water truck. We have continued to maintain these plantings over the years. We have also done ground works nearby at Lakeside where large numbers of Spectacled flying-foxes camped for a number of years. The Bat Hospital recognised the need for maintenance at Lakeside, not only to gain access for rescue purposes but also to eradicate large amounts of the prickly asparagus fern, wild tobacco and coffee. Our partnership with Green Corps in 2008 (through Conservation Volunteers Australia and the Tableland Regional Council) and a team of young people from the University of New Platz in New York boosted our impact. 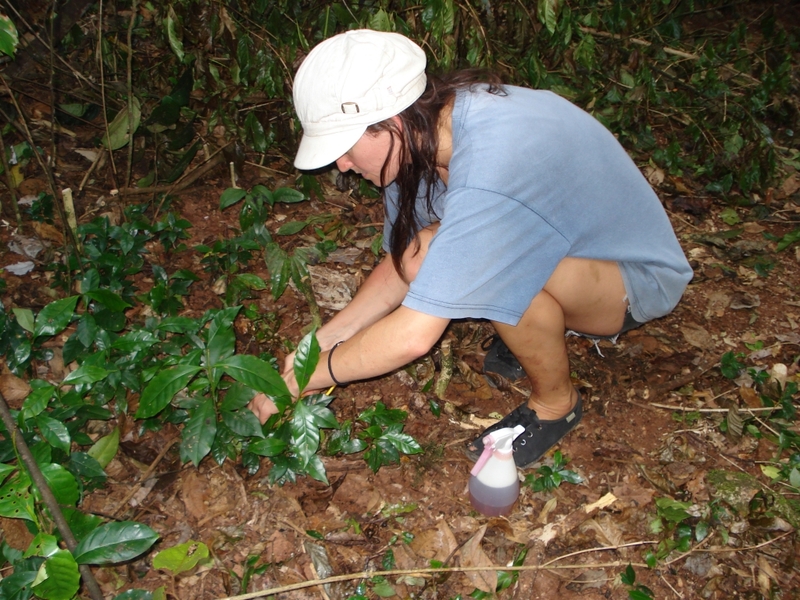 Coffee is a nasty rainforest weed on the Tablelands. No bats at home. Flying foxes away on holidays. Little Reds have babies. Please do not walk through their roost. They willl easily drop their babies if disturbed. Little Reds are visiting. They disturb very easily, please avoid walking through their roost. Tick paralysis and baby time for Spectacleds. Watch for fallen bats. The Little Red flying foxes (Pteropus scapulatus) are sometimes at Tolga, and often in large numbers compared to the Spectacleds. They rarely use Tolga as a maternity camp, but often arrive when the young are flying, around September. The numbers will sometimes build up by the end of the year to be over a million, but they are usually gone again by March when the wet season sets in. Little Reds can do significant damage to the forest if they hang in the weaker mid-canopy trees. This damage is the result of their characteristic behaviour of hanging in ‘bunches’ – the branches cannot take the weight and often bend until they break. This damage will repair itself, unlike the damage being done by the cockatoos that results in the death of the tree. However the Little Reds are sometimes camped in large numbers and do no damage, by camping in the larger trees and hanging apart from each other, rather than in bunches. This seems to happen late in the year, just before mating season. Four consecutive years of heavy winter use by the cockatoos in 2000 to 2004 caused the death of 65 tall canopy trees and subsequent closure of the walking track through the Scrub. Council was granted a permit to use birdfrite as a deterrent to the cockatoos since 2003, and this has been quite successful. A condition of their permit is that they notify us when commencing the birdfrite action. The cockatoos camp higher in the trees than the bats and as long as the birdfrite is aimed high, it appears to have little impact on them. Nevertheless we feel it’s important that birdfrite is not used until the young are independent of their mothers which happens about March. The cockatoos often arrive when the peanuts are being harvested, and try to use the Scrub as a camping spot close to the farms. Unfortunately they trim the new growth off the emergent canopy trees, and the impact was greatest in the northern area where the flying foxes camp. Tony was a great friend of the Tolga Scrub until his death in late 2008. He was a superb bushman with an enormous knowledge of native plants, and an advisor to Tablelands Regional Council on the health of the Scrub.